Love the great outdoors? Then hiking to Machu Picchu is the way to go. Thousands of people from around the world choose to walk along the Inca Trail or other alternative routes such as the Salkantay Trail. Here’s a link to Machu Picchu Trek, where you’ll find a list of possible hikes to Machu Picchu. 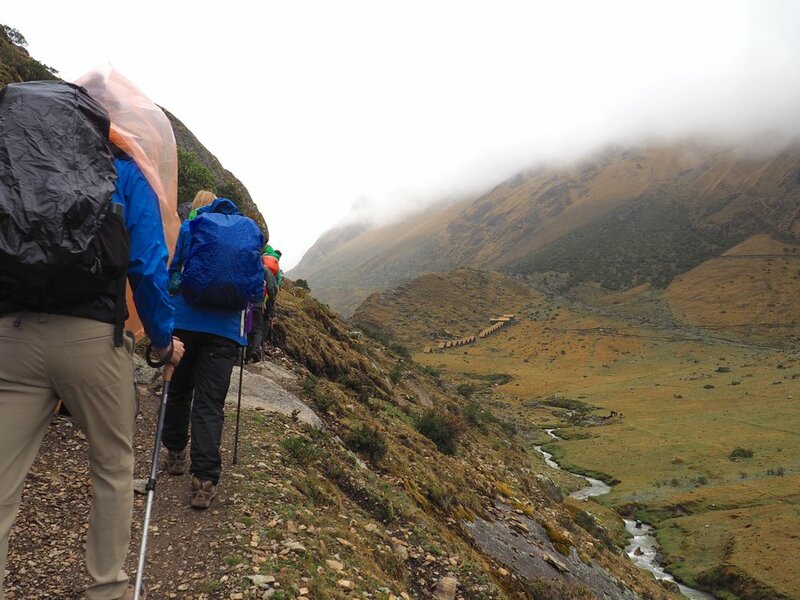 Trekking is a great way to experience Peru’s magnificent mountain ranges, lively forest, and rich culture. But don’t think for a second that these trails will be an easy walk in the park. The Andes mountains in Salkantay rises up to 15,000 ft. – so you’ll definitely want to get in shape before heading out to one of these trails. I decided to book a guided tour with G Adventures, and I had an incredible experience. What I most loved about trekking to Machu Picchu with them was everything was organized and planned to the T! It was a relief to not have to worry about booking train, bus or entrance tickets. If you're interested in hiking the Salkantay trek, browse through the pictures I've taken in my journey here, "Breathtaking Photos That Will Make You Want to Hike the Salkantay Trail to Machu Picchu." Quick tip: Traffic is pretty bad in Peru. Give yourself at least an hour to travel by taxi to avoid missing your train. For more Peru travel tips, read " 9 Things You'll Wish You Knew Before Visiting Peru." Tickets are sold in a myriad of places: Cusco, Aguas Calientes and online. Be sure to book your train tickets as soon as possible as there are limited spaces available. There are three train companies you can choose from, PeruRail, Inca Rail and Belmond Hiram Bingham train. Quick tip: If you’re not a part of an organized tour, you must first book your train tickets. Then follow it with your plane tickets, tour guide for Machu Picchu, hotels and other tours. Unless you plan on hiking to Machu Picchu from Aguas Calientes or the other alternative hikes, you will need to take the bus there. It’s important to purchase your bus tickets as soon as you arrive in Peru. Buses are first come first serve system and tickets tend to sell out fast. If you’re planning on hiking up to Machu Picchu and taking the bus back to Aguas Calientes, you should then purchase a bus ticket at a box office near the Machu Picchu entrance. Quick tip: Purchasing tickets online is known to be tricky and difficult. Consettur is one of the few Peruvian websites you can buy your bus tickets, and they only accept “verified by visa” credit cards. For more Peru travel tips, read " 9 Things You'll Wish You Knew Before Visiting Peru." Out of these three choices, which route are you going to take?! Feel free to share your answers in the comment section. I’d love to hear from you! And if you have traveled to Machu Picchu before, please share your experiences below to help our fellow adventurers reach one of the most beautiful destinations in South America. For more Peru travel tips, read " 9 Things You'll Wish You Knew Before Visiting Peru."